The Tale of Peter Rabbit is a children's book written and illustrated by Beatrix Potter that follows mischievous and disobedient young Peter Rabbit as he is chased about the garden of Mr. McGregor. He escapes and returns home to his mother who puts him to bed after dosing him with camomile tea. The tale was written for five-year-old Noel Moore, son of Potter's former governess Annie Carter Moore. 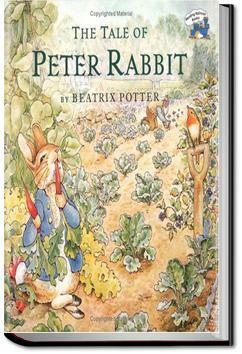 The Tale of Peter Rabbit is the first in a series of delightful children's books by Beatrix Potter. There are twenty-three of these “little Tales” about woodland animals (who are, of course, little people in disguise, as they wear clothes and behave exactly as their human counterparts would). This story reminds me my childhood. I still remember I used to do things from which my mama forbades me. Just like Peter rabbit. Her mother tells him not to go to Mr. McGregor's farm. But as he is a naughty rabbit, He still goes and faces troubles. Peter Rabbit almost finds himself in a Mrs. McGregor's pie, just like his father. ✅ Peter Peter the Urchin aka Hot-headed Kid aka SOS-sending, always-in-a-pickle kid.